Recently ,I have got a request from the business unit manager on the reboot of computers due to patch management (applicable to Applications as well) .The Custom client device setting ‘ Display temporary notification to the user ' (shown below) set with 480 minutes across the enterprise workstations but specific department (ex: Engineering), not happy with this setting due to the nature of their business. So ,we have agreed to have custom reboot settings . Creating Custom device settings and applying it onto collection is not that much difficult but the deal here is,creating a device collection using user department. Once we have this collection,we can create device client settings and make sure this has higher priority over the other Client device settings that has similar setting applied to all workstations.The higher the priority (Low number is applied first than higher number) will be applied onto clients. 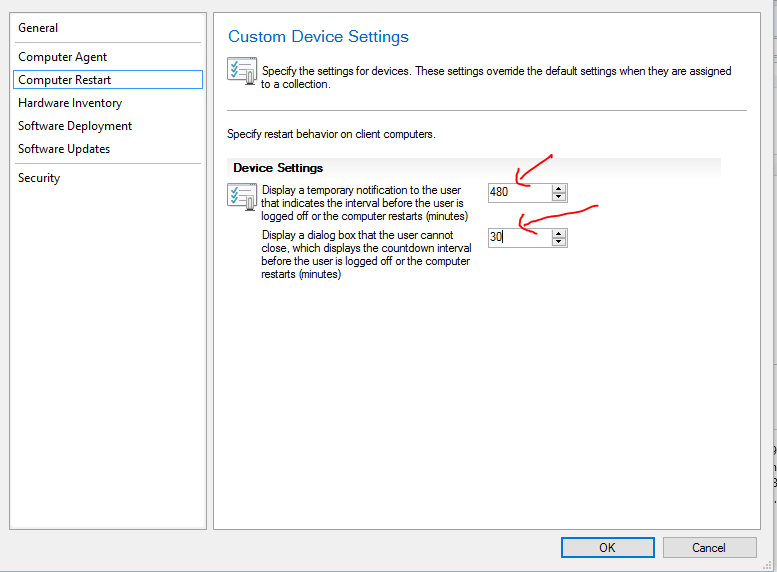 You can also use resultant set of policies to check the client device settings for particular client from SCCM device collection. 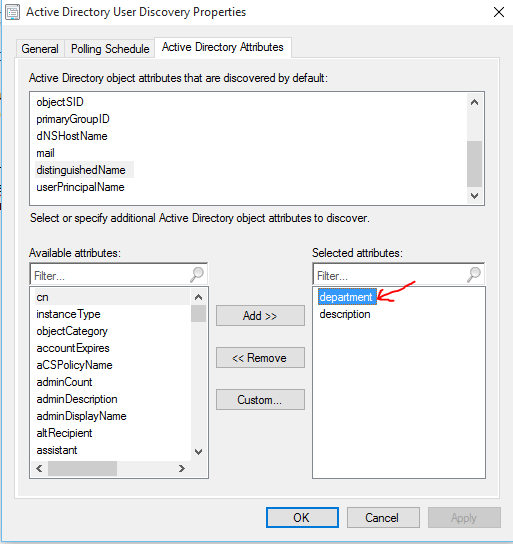 Before creating collection ,make sure you have department attribute added to the active Directory user discovery properties. Create new collection,select the limiting collection,edit the Query ,paste the following query . (change the department Name) .When you click Ok,you may get errors but just ignore them.Collection works good. WHERE SMS_UserMachineRelationship.Types=1 AND SMS_R_User.department0 like "Engineering"
5 Responses to "SCCM Configmgr 2012 Create device collection using the User Department attribute"
Hi, I have added a few user attribute to the user discovery as described above however they never show on the users object properties even after a week. Any thoughts? check user discovery logs if user discovery method is discovering objects of custom attributes that you defined . Hi, I have added the custom attributes as described above: extensionAttribute2, employeeID & employeeNumber to the User Discovery but they do not show, even after waiting for week. Any thoughts? Like where you are going with this... I have multiple domains and only want this to be for 1 Domain and also I want to make this use department as you are but want to exclude all users that have a specific manager (I have this attribute pulled in already) Thoughts? you can go with subselected query here, get list of all users whose manager is x and then use subselected query to filter username not in from all users and domain=eskonr.com..